Initial esophagogram anastomotic stricture (AS) does not correlate with the development of symptomatic AS after EA repair. Upper GI contrast study and endoscopy are important diagnostic tools for symptomatic AS. The anastomotic stricture index (SI) and the esophageal anastomotic stricture index (EASI) were developed to quantify the severity of AS and monitor its subsequent response to treatment. The incidence of AS ranges from 32% to 59%. 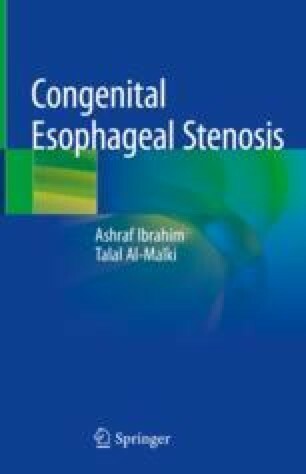 Risk factors include gestational age, type of EA, associated malformation, length of the gap, ischemia at the anastomotic site, suture material, anastomotic tension and post operative GER. A long gap is by far the most significant predictive factor. CES is an important risk factor for refractory and recurrent stricture. The main line of treatment is esophageal dilatation. Other adjuvant strategies for refractory and recurrent strictures may be required with dilatation. Proton pump inhibitors (PPI) are recommended. Surgery is reserved for extremely selected cases.